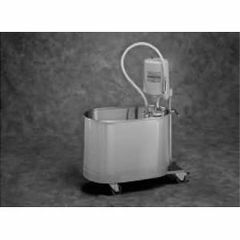 Whitehall P-15-M Mobile Whirlpools are recommendedfor treatment of the foot and ankle area, and when provided with a raised undercarriage, may also be used in treatment of the upper extremities. P-15-M, Mobile Whirlpool is recommended for the treatment of the foot and ankle. P-15-MH, is a Mobile Whirlpool with Handle of heavy duty construction with the hand grip section approximately 36” above ground level for ease in maneuvering the whirlpool from one location to another. P-15-MU, is a Mobile Whirlpool with Undercarriage of heavy duty construction and fixed height which raises the tank for use in treatment of the upper extremities. Whirlpool Tank is 25”L x 13”W x 15”D and is seamless welded construction, fabricated from heavy gauge, type 304 stainless steel, polished to a satin finish. Tank rim is reinforced with a concealed stainless steel rod. Tank is fitted with an auxiliary drain valve. Tank bottom is a seamless, rounded covered design to minimize bacteria buildup.